Tello ends their anniversary month on a high note, launching the most simple and straightforward Referral Program on the US wireless carriers market. Tello ends their anniversary month on a high note, launching the most simple and straightforward Referral Program on the US wireless carriers market: r efer a friend to Tello and both the referrer and referee win $10 Tello Dollars. 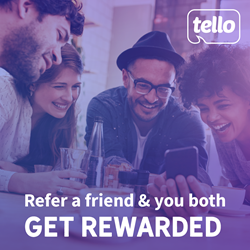 All Tello customers get a referral link they can share with their family and friends via email, Facebook or Twitter. Once the friend uses the link to open an account and purchases a Tello plan or PAYG credit, they'll receive $10 Tello Dollars each. The Tello Dollars can be used to make a purchase (plan, Pay As You Go Credit or a phone), once the amount of Tello Dollars is enough to pay for the entire invoice. And with Tello’s awesome plans, it’s pretty easy to reach an amount that would cover an entire invoice. Why should anyone recommend Tello? At Tello, customers have many reasons to recommend the service to anyone interested in saving money on their phone bills. Customers can choose the amount of minutes & data they need and unlimited texts are included in every plan, free of charge. Phone plans start as low as $5/mo. up to $39/mo. Cell phone plans can be upgraded, downgraded, or renewed at any time, for no charge at all. Besides being flexible when it comes to plans, Tello is also the only wireless carrier rated as ‘Excellent’, as a result of more than 1400 reviews from its customers on Trustpilot, a famous review website getting roughly 500,000 genuine testimonials about thousands of businesses each month.